John and I are scheduled to teach an elective for parents this morning at church about helping students understand their identity in God (self-worth). As a part of the intro, we will talk about the culture we live in that promotes the idea that no one is good enough and we all need improvement (plastic surgery, the next new gadget, diet, etc). 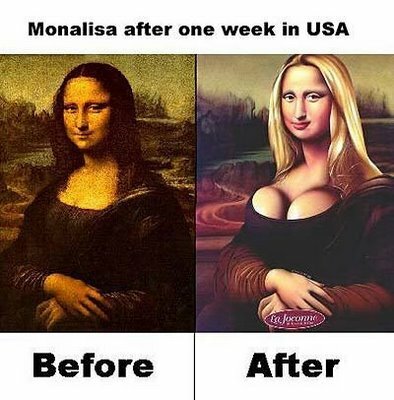 A fun way to look at it is like changing the Mona Lisa. It was created by a master and it is priceless but, in our culture, I think they’d create a false need to make some changes. In my searching, I also came upon this amusing site that lets you change the famous smile (?) of Mona Lisa into some other random expressions. Not amazing, but it is worth a quick look.